Dave's Beer: Amsterdam is so about the bikes. Amsterdam is so about the bikes. Amsterdam is all about the bikes. Its striking. I DO NOT mean it's bike friendly in the bikes-get -a-nice-safe-path-safe-from-cars kind of way. They are a major means transportation for utility. The pictured bike is a type of long bike; this one extended in front (this is a cool class of bikes I've been enamored with forever). They're pretty common. The container on the front is used for groceries, but mostly for shuttling one's kids around (usually two children about 5-8 yrs old). Bikes do have their own throughways, but often share some streets with cars - and, I've witnessed, sometimes violate the unwritten rules of the road and nearly get killed. 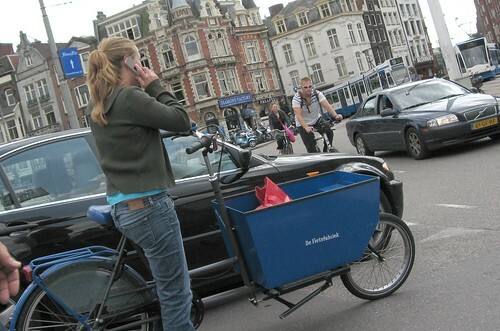 I saw a Dutch guy get out of his car and yell at a trembling Brit couple on rented bikes. If it happened in the states, I think someone would've been killed and courtcase would dragged on about roadrage and gone to the supreme court for the country to watch on television for 3 weeks. In this case, the incident passed quickly, witnessed by only a lucky few. I'm pretty sure it takes a lengthy period of immersion to figure out the cycling rules. If I had a bike, I'd shadow one of the elderly. They get around just fine, slowly. They apparently have lived this life a long time and appear to be darn good at getting around. It's rough, but it's awesome to see this system in action. Pedestrians need to be mindful of cars and bikes. By the way, motorcyclists ALWAYS wear helmets, bicyclists ... never. Opposite Ohio. I haven't seen a single automobile driver speaking on the phone while driving. Been cool so far. So glad you're having a great time. I love Amstel Light, but everyone tells me in Amsterdam it's just Amstel, but it's considered Light here, hence the name of Amstel Light. Can you investigate this? (Only kidding). Love the sparkle shoes on Frankie. Love the pics of Amsterdam as well. Enjoy!